Brother Lawrence, Franciscan Friar, exhorts us in his “Practice of the Presence” to find the sacred in the very mundane like washing dishes, sweeping, and doing the laundry. We have the chance every morning, regardless of how busy we may be, to do precisely this when it comes to showering, combing hair, shaving and brushing teeth. In fact, this last activity, brushing, we are told by dentists, to not rush or skimp on. I find it very diagnostic to reflect on my impatience with waiting the requisite number of seconds to be sure I am thorough. 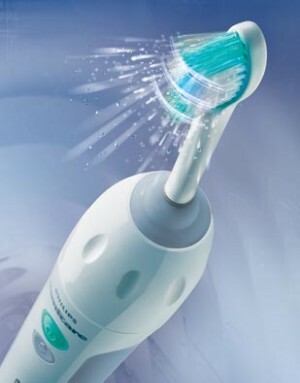 Enter the sonic toothbrush! The one I was given stops ever so briefly to let you know it is time to move from the top set of teeth on the front side to the under side, etc. Well, it seems simply interminable! So, here’s a great practice in being present and emptying mind of all the rushing ahead. Stay in the moment and wait the full time as measured by the brush. 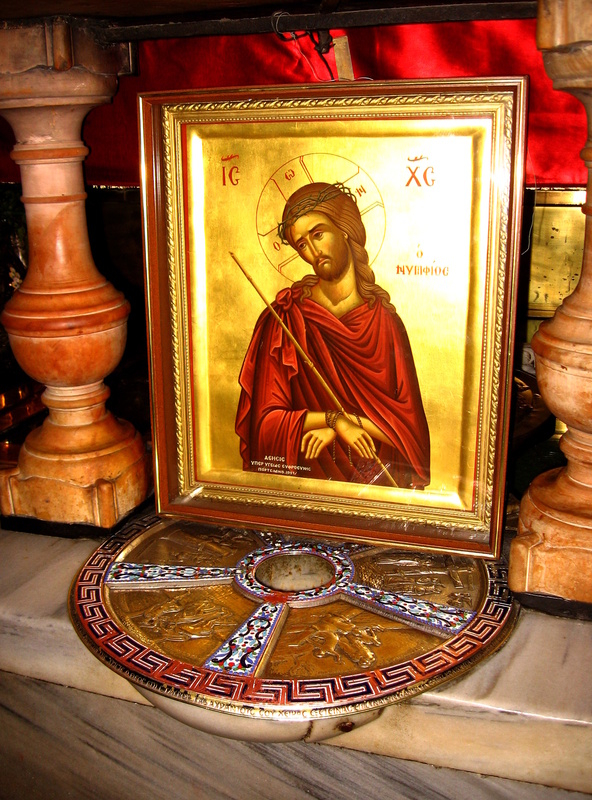 I’ve been adding the Jesus Prayer from the Philokalia as I do so: ” Lord Jesus Christ, Son of God, have mercy.” Of course, you can add your own mantra. Good for the soul and good for oral hygiene – a twofer! timeless Presence making everything new. I reach so wide that time and distance have no measure. and tune to the beat that fills my lungs with silence. all is well in the deep, and music to my joyful ears. 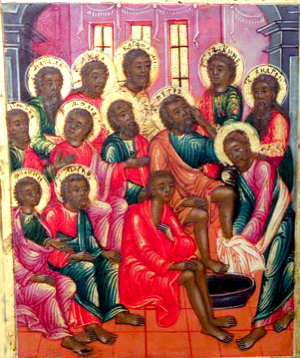 A day also called “Maundy” Thursday in the Anglican tradition, or the “mandatum”, the mandate to perform the “Lord’s Supper.” This is also the day of the washing of the feet. Traditionally, the Pope washes the feet of priests and priests do so for parishioners. Together, these ritual jewels of the Church celebrate the central mystery: the Presence of the divine savior among us in the intimate acts of washing and eating. A good friend and fellow Bishop refers to the “Mass” as “Divine Alimentation.” We are fed by the Prince of Peace. We are directly privy, without need of any intermediary, to the sanctum sanctorum. Celebrating the savior in an act of eating is to continue in the path of total conversion; the transfiguration of mind-body and spirit from the inside out. We literally become the Temple of the Lord. The word “Mass” is telling. It derives from the latin word “missa,” which means dismissal, or, put differently, a going forth in accordance with a great commissioning. In the Lord’s Supper, the Eucharist, we are fed with the expectation that we will then go and likewise feed others. We are given the mandate to be fishers of men and women; to bring them the great comfort and consolation of the truth that the Kingdom of G-d rests within them. 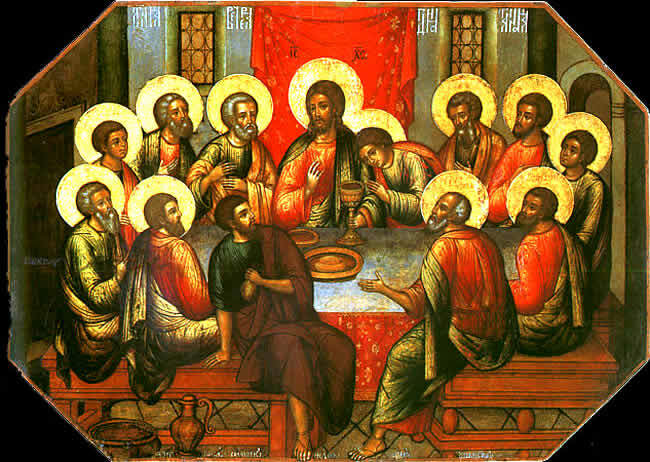 It is traditionally on Holy Thursday that the bishops consecrate the oils of chrism, the catechumens, and the sick. In addition, the Holy Thursday celebration also calls for a gathering of the priesthood so that priestly vows can be reaffirmed. Looking at the day in its entirety, we recognize in it a call for deep personal and transpersonal renewal and a resetting of purpose. It is a time for blessing, cleansing, and the reinvigorated zeal to serve the Gospel. We are reminded of our sacred identity and our calling. It is a beautiful celebration and it is an alchemical re-enchantment. I am a priest. I vowed to serve for the rest of my life. My service is different from that of a parish priest as I do not have daily celebrations to officiate but mostly ad hoc ones. As the Abbot of a “monastery without walls,” the role is that of spiritual facilitator, teacher, friend, and the sacerdotal functions come as they may. What does it mean to be a post-denominational priest? It means that one’s identity is wrapped in continuous and diverse prayer, and the readiness to fulfill the mandatum in nontraditional ways. It means finding new paths for engaging the teaching in dialogue with people while maintaining a less visible or pronounce priestly profile. It also always calls for celebration of the sacraments as living vehicles for conversion and epiphany when there are two or more gathered with a yearning to do so. I enter into this Holy Thursday evening as I have earlier ones, with a deep sense of awe and gratitude. I feel honored to have been called to witness to mystery and to be a voice for spiritual living. I rejoice in the meditative time in which I can hold up all those I love and know, and the world around me with profound hope of an enduring illumination. I rest tonight in the firm conviction that a powerful force is present to synchronistically guide my next steps and words. I am a child of the stars, of the wind, of the stillness and of the laughter. I am a child of the Eucharist and a minstrel singing about the depth and breadth of our capacity for love. I am a humble poet searching for the right words and phrases to give sound to my heart. I am a simple priest. I open myself to the next mandate, the next need, the next chance to touch the fabric of the Son of Man. I am one who is ever searching for His face among all the writing, all the poetry, all the religions, all the cries and tears and laughter, and the rich tapestry of human thought and scientific discovery. A person should examine himself, 13 and so eat the bread and drink the cup. For anyone who eats and drinks without discerning the body, eats and drinks judgment 14 on himself. Therefore, my brothers, when you come together to eat, wait for one another. If anyone is hungry, he should eat at home, so that your meetings may not result in judgment. The other matters I shall set in order when I come. 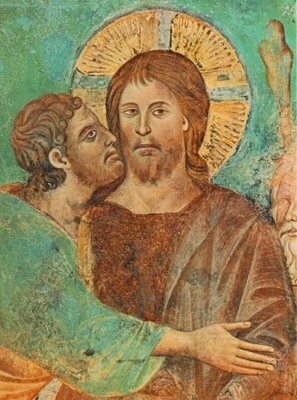 This day is also called “Spy Wednesday,” the day designated by the Western Church, as the one on which we recall the first betrayal of Jesus by Judas Iscariot in his collusion with the Sanhedrin, while Jesus was himself at Bethany where he was anointed by Mary, sister of Martha and Lazarus. The spikenard oil she used was expensive, and so a controversy broke out among the apostles over what seemed to them an extravagance, and frivolous behavior on Mary’s part, especially given the fact that the oil would have fetched a good price at market and the proceeds could have been better applied to feeding the poor. The power of this day is in the parallel themes of betrayal/ second-guessing, and a costly, unhesitating generosity. On the theme of betrayal, we can all painfully recall moments when those close to us have acted without forethought in ways that hurt us. Maybe they revealed a confidence, or chose to openly criticize us in front of others, perhaps making use of knowledge that they could only have had because they were so close. Much in the news these days, and far more serious, are the stories of flagrant infidelities; promises broken that wound whole families and tarnish reputations. Very often, the one committing the act of betrayal is well-intentioned if misguided. In the case of Judas, he was the dupe of the Sanhedrin. He envisioned a rapprochement between Jesus and the Sanhedrin. His real sin was in being so blinded by his own egoistic vision of how things should evolve ( and his inflated sense of himself as more politically astute) that he failed to accurately read the motivations of shadowy and secret alliances, and the deeper vision of the one he truly had hoped to serve. When we let people draw very close, they become the most dangerous people in our lives. They have intimate details of our habits and usual whereabouts and our soft spots and vulnerabilities. The old cliché “you hurt the ones you love” is all too true. We are given a treasure to hold when people offer themselves to us in deeply personal ways. Our faithful stewardship of that gift is a spiritual imperative. In acting, we must always ask: In whose interests am I acting? To what degree is it mostly about my needs, agendas, priorities and beliefs, and not theirs? There are certainly betrayers among us, and those who one day can become so. One only need look at the depth of enmity expressed between once trusting but now estranged partners in a marital breakup to see the tragic miscarriages of love. More important on this day, however, is the “spy” (or betrayer) within. It is a day on which to think back to the moments when our own better judgment was absent, and when we acted so foolishly as to cause someone dear to us to suffer through our words, deeds, or sins of omission. There are also those times when we feign friendship in cultivating a politically valuable relationship. In those moments, we deceive and are disingenuine, using the other person for our own ends. (We have all been there either dramatically or in more subtle and nuanced ways). The Gospel calls us to a very high standard of conduct. It demands so much more from us by way of fidelity and follow-through on our commitments and vows. It also demands that we move swiftly to forgive those who wrong us through a thoughtless word or deed for there, by the grace of G-d, go we. We live in a time when vows seem anachronistic. This is the age, after all, of the pre-nuptial agreement, and the so-called “trial periods” of living together. We suffer cultural paranoia and so risk losing the joy attached to firm and unshakeable vows in which our fidelity, though surely to be tested, is proven resilient and robust. In achieving such relationships, we move, as Teilhard de Chardin captured in his writing, toward the “Pleroma,” or the Fullness of the Christic vision. What are the vows that I have taken? Today is a good day to renew them and consider the history of my faithfulness to them and where, when, and why I fell short. On the matter of the anointing with precious oil by Mary at Bethany, I can certainly appreciate the frugality expressed in the Apostles’ objections. The act seemed wasteful and careless. Of course, this is the epitome of homo economicus, a strong feature of the current zeitgeist. But there are other considerations. In Mary’s gracious act of expending the precious oil, she, in one movement, foreshadows the Chosen One, the death on the Cross, and the later anointing of Jesus’ crucified body with the precious oils as mandated by Jewish custom of those times. Her intent, in the moment, spontaneously and without calculation, was to signify, viscerally and sensually, the deep personal meaning of her vow to Jesus, her devotion, and Christ’s unshakeable vow to the World; to be its Light! My daughter has her best friend joining her in our home this week for a few days. My wife and I are delighted to see her again and extend the warmth of our home to her. We have worked pretty hard over the last few weeks to make things ready. We wanted her to feel an important part of the family. We have (and would always) go the extra step to make the time and the space special, and invest the resources to do so. Now, one can argue that the “budget” may not have a line item set aside for such an occasion, especially because they are usually not planned well in advance. In our case, we accelerated needed work on the room that would be offered to our friend and guest. We redecorated it (certainly with the longer term future in mind) but with principal focus on making her time with us very special and memorable. There are times when we spend more than others might, who, looking “in” at these times of constrained finances, might challenge the wisdom of unflinching and unreserved hospitality. They might (and have) argued that doing less is more prudent, and that the extras are nice-to-have, but maybe ill-timed. These are well-meaning comments and articulate a reality I recognize, particularly since the economic crash of late 2008. They are offered from an objective and essentially economic vantage point. Nevertheless, having acknowledged that, our choices are motivated not by objective criteria alone, but more substantially, by a subjective “enthusmia;” our intent to create a place of relaxation and restoration, a sanctuary of warmth and friendship. In doing so, we extend our love for our daughter to all those that she calls “friend.” This is as it should be. This is spiritual practice ( and very much consonant with the spirit of Franciscan Spirituality). While one can still be “economical,” life is too short to miss the small chances to add light and joy when given the opportunity to do so. Hospitality, as I wrote in an earlier post, is an advanced form of spiritual practice, and it warrants pulling out our finest linens, dishes, foods, and, yes, the precious oils by which to “anoint” in the names of Love and caring. The Spirit of Holy Wednesday asks us to retake our vows, redouble our efforts to fulfill them, and recalibrate the sincerity of our loving so that it transcends the vagaries of politics, economics, and all the many other temporal agendas. 10And Judas Iscariot, one of the twelve, went unto the chief priests, to betray him unto them. 11And when they heard it, they were glad, and promised to give him money. And he sought how he might conveniently betray him. 12And the first day of unleavened bread, when they killed the passover, his disciples said unto him, Where wilt thou that we go and prepare that thou mayest eat the passover? O Lord, the woman who had fallen into many sins, sensing Your Divinity, takes upon herself the duty of a myrrh-bearer. 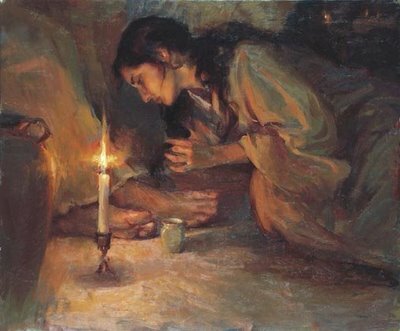 With lamentations she brings you myrrh in anticipation of your entombment. “Woe to me!” she cries, “for me night has become a frenzy of licentiousness, a dark and moonless love of sin. Receive the fountain of my tears, O You who gathers into clouds the waters of the sea. Incline unto me, unto the sighings of my heart, O You who bowed the heavens by your ineffable condescension. I will wash your immaculate feet with kisses and dry them again with the tresses of my hair; those very feet at whose sound Eve hid herself from in fear when she heard You walking in Paradise in the twilight of the day. As for the multitude of my sins and the depths of Your judgments, who can search them out, O Savior of souls, my Savior? Do not disdain me Your handmaiden, O You who are boundless in mercy. © Brother Anton and The Harried Mystic, 2010. Unauthorized use and/or duplication of this material without express and written permission from this blog’s author and/or owner is strictly prohibited. Here in the Northeast, this day has been one of incessant rain and cold: a thoroughly raw and inhospitable day. While the first buds of Springtime have appeared and the forsythia are in partial bloom, it feels as if Springtime has been put on hold, in stasis for a time. A sheet of dark clouds fills the sky. I also discovered today that one of the large evergreen trees in our yard fell unnoticed into an adjacent one in a storm of several weeks ago. It is being supported by the other tree but can, with another windstorm, fall and destroy the fence and a shed that it now is just grazing. Other smaller evergreens also fell to earlier storms and the debris is abundant. The task of Spring cleaning will be time-consuming this year. Inspecting the property for damage and assessing what needs priority attention was well-timed to today’s celebration of Holy Monday. This is the day on which we recall both the life of Joseph, one whose loving heart made possible the care and nurture of a soter, and also the fruitless fig tree cursed by Jesus: a symbol of Pharisaic and official religious who are full of words but bear no fruit. This day is a time for meditation on who we are, striped of all the public and quasi-public masks. It is a day to contemplate authenticity and what it means to bring ourselves daily to the work of being found fruitful when the Bridegroom comes as Joseph surely was. We are invited by the Spirit to live joyfully and productively in the service of true compassion in the world. We prepare today, at the opening of Holy Week, with reflection on where we are inauthentic, not truly ourselves, dishonest, uncaring and narcissistic. We are invited to inspect our inner “yard” to identify the priority debris that needs Spring cleaning. What fruit have I produced that radiates the Light of Christ? What thoughts nourished such fruit, and what thoughts rob them of needed nutrients? In examining my behavior within the last 24 hours,was I a vigilant steward of the essential teachings? 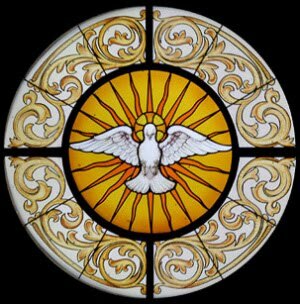 How will my reflections today shape Holy Tuesday? How do I envision living tomorrow? But unworthy he whom He shall find careless. Beware, therefore, O my soul. lest thou be given over to death and shut outside the kingdom. Holy, holy, holy art Thou, O God! © Brother Anton and The Harried Mystic, 2009. Unauthorized use and/or duplication of this material without express and written permission from this blog’s author and/or owner is strictly prohibited. On a visit last week to Fort Lauderdale, I visited the Butterfly Garden with my wife and daughter. 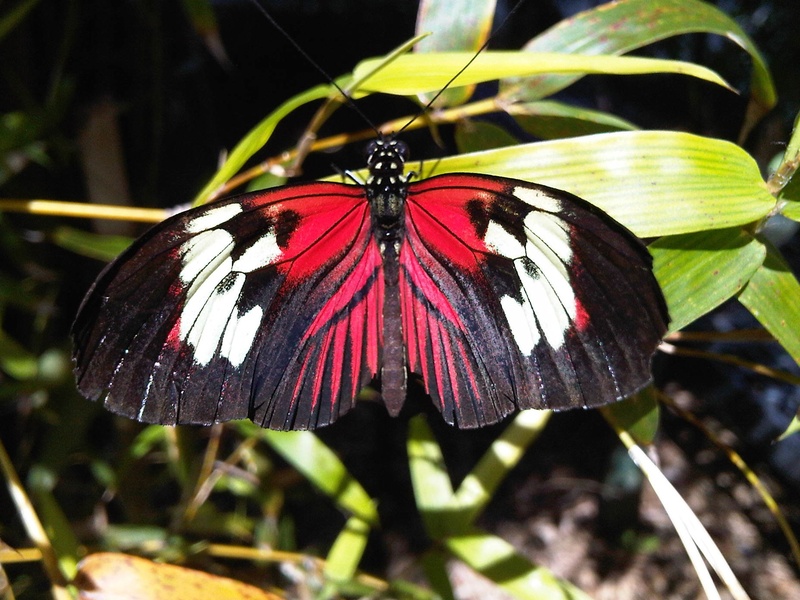 The weather was on the warmer side, the sun shone brightly, and the butterfly aviaries were a delight. We spent a few hours walking through the extensive property made up of a small bridge over a well manicured pond, colorful plant life and trees, and, of course, quite a few separate aviaries dedicated to diverse species of butterflies and one set aside for hummingbirds. The best part of the experience was to sit quietly on a bench surrounded by tens of butterflies and letting them settle on my arms and clothing. Fortunately, the aviaries were not crowded with people so it was easy to sit for a while and appreciate the amazingly rich array of color and patterns. These are among the most fragile of life forms but few are as inspiring. Just before Easter, they served as a marvelous metaphor for resurrection and rebirth given the metamorphosis from caterpillar to taking flight on breathtaking wings ranging from pure white to spotted, turquoise, various pastels, full yellow, and a striking red and black variety ( see the picture above). It is hard to imagine being anxious (barring phobias) in such spaces. A sense arises of the inter-connection of all things. What a privilege it is to be conscious and able to savor for days weeks and months to come the experience of a quiet afternoon in the Florida sunshine with creatures such as these. As I walked and took my many pictures using my cellphone camera (which, surprisingly, captured some wonderful shots), I came upon a white butterfly that sat on the ground in harm’s way already clearly having suffered wing damage. I became immediately saddened at the sight and then pensive at the scene as one tries to reconcile the tragedies of life with its glories. What came swiftly to mind is the rosary and the important juxtaposition of the Sorrowful, Glorious, and Luminous Mysteries. Almost without a thought, I felt compelled to pick up the butterfly and return it to a nearby leaf. It was clear that it was dying, and it felt right that it should do so on a leaf and not against the cold, unnatural pavement. I am a panentheist and this moment brought that home to me once again. The Spirit runs through all the created. Each natural form is a face of the mind of Ein Sof, the otherwise unknowable. Once again, as creatures with personhood, we know the Divine Presence personally. 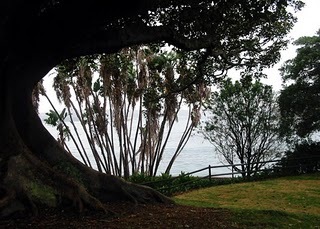 We feel the Presence more so than we can adequately think the Presence. This is the Gnosis Kardia, the Knowledge of the Heart. So, on a quiet March day, just a week ago, I was visited by a butterfly who stopped me in my tracks to consider my own mortality, the mortality of others, life’s mysterious transits, and the power of regeneration, resurrection, renewal and the true heaven that emerges in every moment illuminated by authentic compassion. This is Holy Week in the Western calendar. May this week be a time for you of profound revelatory moments, of transformative experiences, and a deeper dive into the Heart of the Cosmos. When I usually think about the matter of our advancement and progress as a species, I, as I suppose many, begin to enumerate technological accomplishments, innovations, and breakthroughs in our understanding of the universe. All that is certainly relevant. But, a simpler, more straightforward, and not sufficiently well appreciated metric is the condition of our public toilets. Civilization is really less about knowledge and more about compassion, fellow-feeling, watching out for one another, empathy, and caring. Without these qualities, our advances are cold, and can too easily convert to a merely more sophisticated manifestation of barbarism. So, how far really, examining the state of public bathrooms, have we truly come? I never cease to be amazed by the deplorable state of American public toilets. I will spare my reader any of the imagery that I am sure s/he can conjure at the mere thought of American restrooms. If we look at it as a reflection of how advanced we are as a culture, the experiences all Americans and visitors to our shores have had paint a depressing and demoralizing portrait indeed. I am constantly shocked at what I discover in public facilities. How can people, who no doubt are, for the most part, otherwise fine and upstanding citizens when in the public eye, behave so thoughtlessly when in these private moments in public facilities. To leave the toilets in the way they do suggests a total absence of civilized attitudes and mores. There is a passive aggressive character to what one sees in these places. One’s heart goes out to those who have to put things right who are in the employ of the restaurants and stores. By contrast, my diverse British, European and Asian experiences suggest far more mindfulness and care in leaving a clean facility the way it was found. There is a cultural maturity that American society appears to have not yet achieved. 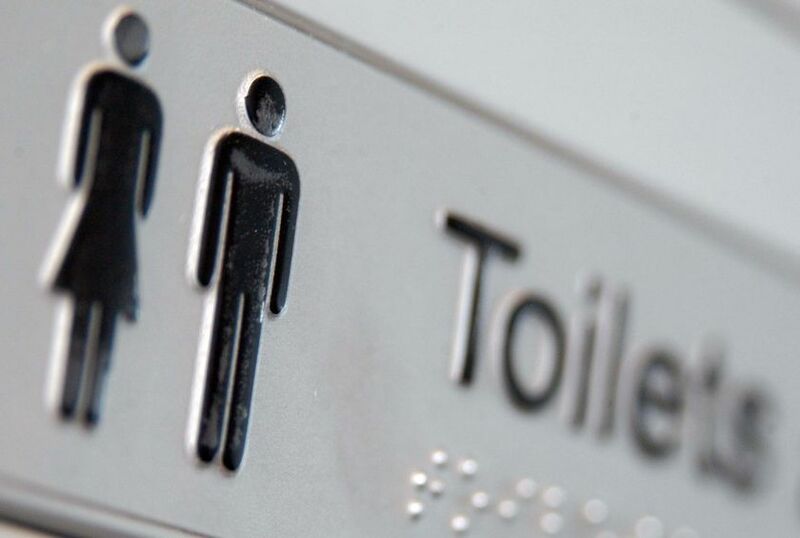 With the state of public toilets as a measure, we in the U.S. are relatively uncivilized. The behavior is at best adolescent and at worst the product of people who lack even the most rudimentary hygiene and social graces of a toddler. It seems to me that one cannot talk about spiritual progress unless the words are first made credible by virtue of lifestyle and action. For all the rhetoric about social progress, this is one example of the distasteful truth that our illusory march of civilization is a quite thin veneer; a pretense, a front for violent, thoughtless disregard for others. I imagine that these people, who anonymously deface and defile our public bathrooms, act, for the most part, with what must be a feigned cordiality and at least a modicum of intelligence in the open square when their behavior is anything but anonymous. The measure of spirituality is what we do when alone and when others cannot see what it is we are doing. By that reasoning, there is a much distance that we need to travel before we’ve earned the right to be known as civilized society. As a personal practice, I work to be attentive to what I pass on to others from the standpoints of both the quality of my work, and the simpler gestures of care and concern. ensuring that the person who follows me will be glad that I preceded him. I hear a lot of talk about civility ( and the lack thereof) and I often make comment about it. The talk is fine as long as we are spending our energy to do what’s right on behalf of the next person. Anything less is hypocrisy and sophistry.